When I got the opportunity to play two of the most iconic analog synthesizers of all time, I almost cried when I couldn't take their warm, fat tones home with me. So I came up with a way to do just that — without spending thousands. This is a collection of 70 sampler instruments taken from a Moog Voyager and a classic Minimoog Model D.
The patches have been designed to ensure that they are versatile enough to work in any modern music. And the sounds have been sampled in exquisite detail, with several thousand samples in multiple velocity layers to retain the delightfully "imperfect" character of these synths. A look at some of the sounds included, demonstrating their flexibility and some ideas for how they can be used. If you'd like to know more about the instruments we sampled, we made a video comparing them. These sampler instruments are offered in EXS24 and Kontakt formats (the download contains both). Use with Kontakt requires the full version - Kontakt Player will not work. The samples themselves are formatted as 16 bit WAV files. The instruments are made up of over 3000 individual samples. Most instruments (except percussive sounds) are capable of infinite sustain, since each sample has been painstakingly looped. Wherever possible we took long loops to preserve the minor instabilities that are characteristic of analog oscillators. Many sampler instruments take unfiltered waves from a synth, then filter them in software to minimize file size. However, doing it this way means you lose a huge part of the character of the synth - its analog filters. We didn't like this method, so we took a different approach. We recorded each synth patch with several different filter (and other) settings, then set up our instruments so that the tone of the instrument is controlled by velocity (how hard you hit the key). This means that you have access to the synth's genuine filter movements, and often other tonal characteristics as well. And trust us, these things sound juicy. There are several benefits to sampler instruments that even the original instruments don't have. The synths we sampled are monophonic - only one note can be played at a time. But the sampler instruments have no such restriction. This means you can use them to play huge, rich chord sounds. But of course in other ways, sampler instruments can never compare to having the real thing. For one thing, you can't tweak the sounds any way you want. We have tried to make synth patches that are relatively simple and extremely versatile, so they can be used in almost any context. Basics: The pack includes the 7 unfiltered single oscillator waveshapes from the Model D. These oscillators are still considered the holy grail of analog synthesis, and you can hear why. They're powerful, rich and fizzy, with an incredibly organic feel. You can use them in conjunction with software filters and effects to build your own sounds. Experiment with layering and combining them, or just use them on their own because they sound great. Bright Squares: A punchy, bright and crisp sound with a fast attack and decay. Electro Bass: A mean sounding bass with a buzzing high end. Fast Attack Saw & Square: Another punchy sound with a fast attack, using both a saw and a square wave. FM Bells: Using the Model D's Oscillator 3 to modulate the pitch of Oscillator 1, we produced a convincing bright and metallic bell sound. Sound particularly good in higher registers, almost like a glockenspiel. Gooey Reso Bass: An understated but extremely warm bass sound with a squelchy resonant filter movement. House 5thsv: Great for dance music chords or bass, with an oscillator tuned to a perfect 5th for lovely harmonics. Detune Bass: A clean, rounded sound with a clear attack. Perfect for techno, house and minimal baselines. Moog Mallet: Perhaps the most velocity sensitive sound we've made. At low velocities, this is an extremely tight and punchy sound, which works equally well as a bass sound or a harmonic percussive part. As the velocity increases, the release increases, and more white noise is allowed into the sound, making for powerful notes that ring out beautifully. Noise Modulated Grit: A sound in which the pitch is modulated gently with white noise, giving a gritty, wavering sound that works well for bass, or, if drenched in delay and reverb with the release extended, as an atmospheric lead. 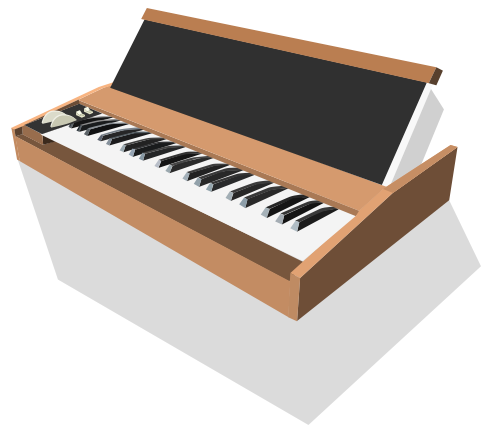 Organ Moog: An organ-like sound that is great for sustained chords or bass. No velocity layers. Overloaded Saws: For this sound we used the infamous "overdriven filter" trick on the Model D, which results in a very rich, fat sound. Very versatile, great for bass or arpeggiated leads. Overloaded Square: Again using the overdrive trick, this sound has a mean attack in the lower registers and rich harmonics higher up the keyboard. Reedy Keys: A keys sound made with a thin pulse wave and some pitch modulation. Like most of the sounds here, it works equally well for bass or higher sounds. Resonant Saw: A single saw passed through a filter with a medium speed envelope. As velocity gets higher, the resonance on the Moog was turned up, with the result that that famous filter really begins to scream. Great for arpeggiated bass parts. Retro Lead: Can be used to play classic "Moogy" lead lines, but works just as well in other contexts too, such as for bass or sustained chords. Rhea Cello: Based on the Cello sound in Tom Rhea's classic Minimoog Patch Book. Lovely and rich, with some pitch wobble. No velocity layers. Rhea Electric Piano: Although Tom Rhea's Electric Piano sound doesn't really sound anything like an electric piano, it's a beautifully smooth electronic keys sound, which would slot in well into ambient, electronica, techno, house, and almost any track with a laid-back or moody feel. Rhea Xylophone: Again, it doesn't sound much like a xylophone, but it's a delightfully simple and timeless electronic sound. Rich Smooth Keys: Does what it says on the tin. A simple, but gorgeous "horn-like" keys sound. Rough Saws: A buzzy saw-wave based sound, good for a rowdy bass or arpeggiated sound. Shamizen: A plucked string sound, with an eastern feel. No velocity layers. Short Pluck: A tight, punchy percussive pluck. Single Saw (Filt Env): Sometimes the simple sounds are the best, particularly with the Minimoog. Just a single saw wave with some filter movement, but boy does it sound fat. Single Square (Filt Env): Ditto for a square wave. Stir It Up: Based on the famous Minimoog sound used in Bob Marley's Stir It Up. Play G, C and D for some classic reggae nostalgia, but this is a great and versatile sound in its own right, with incredible warmth. Struck Pipe: At high velocities a wide resonant filter movement gives the impression of striking a tuned pipe, but at low velocities a smaller filer movement produces an incredibly smooth but punchy and deep sound, great for bass in dubby or dark electronic music. Sweet Slow Sweep: A very slow resonant filter movement produces a highly recognisable "Moogy" sound. Fantastic for basses or rich, subtly evolving chords. Vocal D: A throaty sound with a strangely "vocal" quality to it. Basics: The pack includes a selection of 8 unfiltered single oscillator waveshapes from the Voyager. You can use them in conjunction with software filters and effects to build your own sounds. Experiment with layering and combining them, or just use them on their own because they sound great. The pulse waves were taken at a variety of positions on the Voyager's waveshape knob, which are represented by the corresponding numbers in their titles. Larger numbers correspond to narrower pulses. Blitzkrieg: A ripping sound with punchy resonant attack. Good for bass, but capable of some cool "circuit-bent" leads in the higher registers too. Blitzkrieg Overdrive: Overdriven version of Blitzkrieg which adds distortion and a more "broken up" feel to the Blitzkrieg sound. Great for dirty basslines. Classic Lead: A classic Moogy lead sound. Play in "mono" mode for a Moog-like response. Deep Reso Riser: Great for "rise" fx sounds, but also capable of being played melodicially. Nice atmospheric feel and warm harmonics. Demon Arp: As you'd expect, great when played in arpeggios (try in mono for computer-game-like effects), but it has a lovely warm bass tones too, and can be played for organ-like chords. Destruct Bass: A deep, attacky overdriven sound for ripping basslines. Electro Punch: A hollow electrical sound with plenty of fizz and upper harmonics when played at high velocities. Fat Squares FM: A mixture of square waves and frequency modulation give this sound a dark feel. Works equally well as a bass, chords or lead. Reduce the release for a punchier feel. FM Dark and Hollow: Understated but sinister, this sound makes a fantastic bass but is also capable of leads and chords with a deeply "synthetic" colder feel. Layered Squares: This sound, made up of stacked square waves, has lots of velocity filter response. By playing a mixture of velocities, you can get loads of movement. Great for bass or "tech-housey" stabs. Metallic Bass: The "bass" in the name is misleading - this sound is just as good for high arpeggiated chords or leads. Lots of velocity response make this a really expressive sound. Mogoder: A personal favourite! An attack that sounds unmistakably "vocal" and lots of velocity response. Play it and hear your keyboard talk. Moogsichord: A "nicer" sound very reminiscent of a plucked or hammered string. With a synced oscillator and plenty of interesting harmonics. Equally beautiful in any range on the keyboard. Overdriven Sync: A simple saw-based overdriven sound, this one shreds in the bass and treble frequencies alike. Plucky Sync: With a classic "plucked saw" tone, this one can be used for fast-moving basses, arpeggiated chords, and much more besides. Very warm and velocity-responsive. Reso 5ths Pad: A highly atmospheric pad. Utilising the Voyager's dual stereo filters, this one has some amazing movement in the stereo field and a very warm character. Drench in reverb for ready made ambient music! Rounded Bass: A very crisp, clean, round sound with huge bass extension. Also sounds great for mallet-style arpeggiated lead sounds. Perfect for use in minimal techno, ambient, electro pop, or many other contexts. Simple Saw Pad: Does what it says on the tin. This one's great for adding some warm ambience to any track. Slow filter movement that increases with velocity. Play softly for a very organ-like tone. Simple Strings: A warm synth string patch with plenty of velocity response. Sounds organ-like at lower velocities. Use your keyboard's modwheel to increase the amount of vibrato. Simple Sub: Does what it says on the tin. Use this for your track's bottom end and feel the depth! Those warm, smooth harmonics really make all the difference. Higher velocities release more harmonics. Square Blip: A non-sustaining sound, this one is great for bleepy arpeggiated lines. Some lovely velocity response used the Voyager's bandpass (LP/HP filter) mode so it gets thinner and brighter as you play harder. String Thing: A pad with lots of filter and harmonic movement in stereo. Really nice fuzzy retro style at lower velocities, getting larger and more epic as you increase the velocity. Sync Screamer: At high velocities this one has some crazy resonant synced-oscillator movement, great for bass and leads alike. At lower velocities it's much tamer. Woody: A non-sustaining sound, this one has mallet-like qualities in the high registers, forming a nice understated rounded bass in the lower registers. Great played in arpeggios. All content © 2015 Sound Guru.